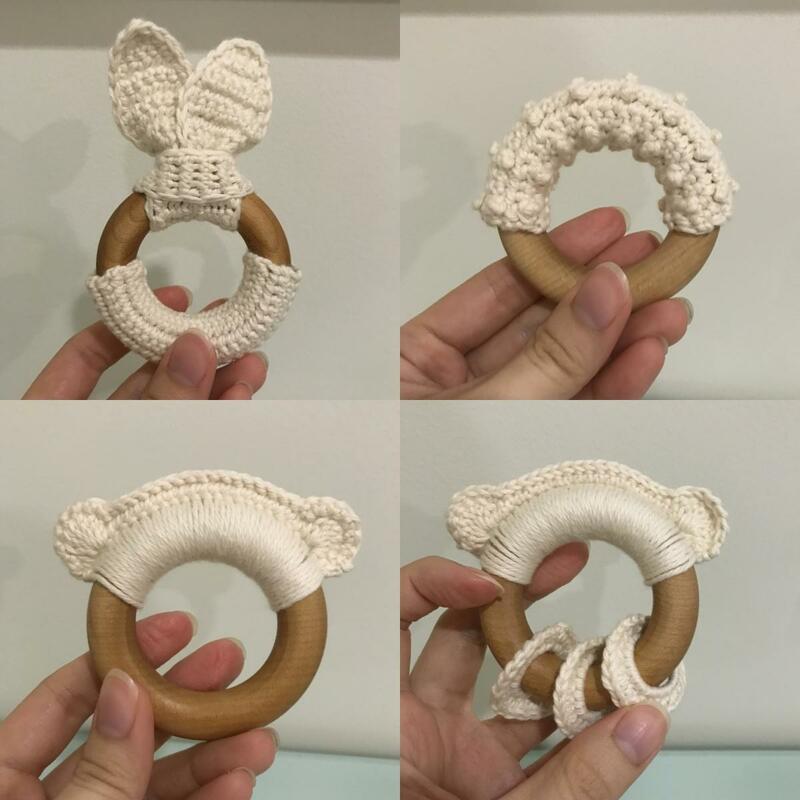 The "Gentleman's Favour" is a simple corn dolly to make, which can be completed in under ten minutes once you get the hang of the craft. This basic pattern will produce a pretty piece that is traditionally worn in jackets or hats. 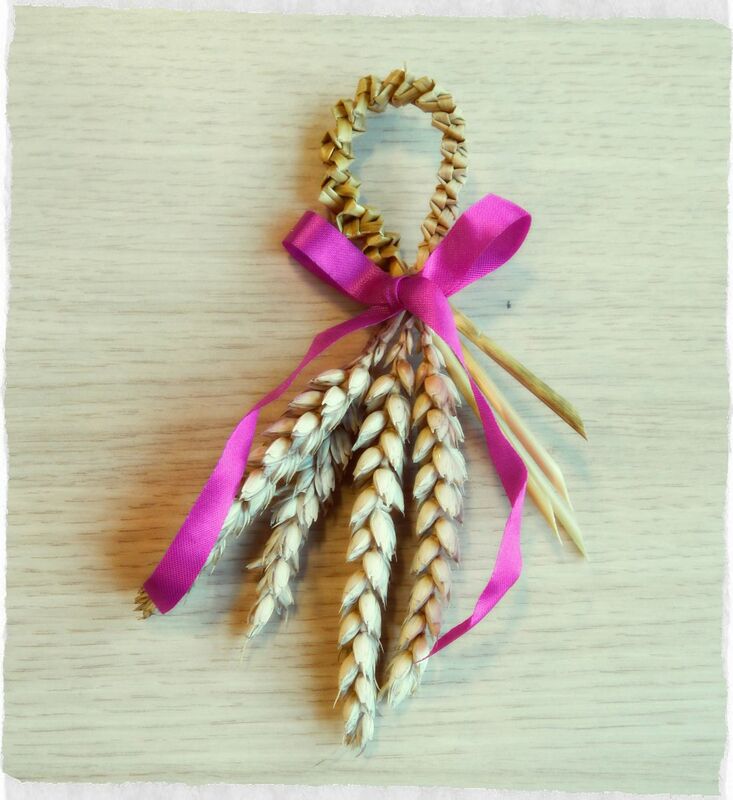 I was told that the men cutting the corn would save a few stalks for themselves, then make themselves one of these to wear on their jacket at the village dance, held to mark the end of the harvest. They might even be given to a lass who caught their eye, in the hopes that a kiss might be given in return! There are slightly different versions of this pattern up and down the British Isles, but this one is local to north Worcestershire, in England. Besides being worn, these dollies make beautiful decorations for Yuletide. 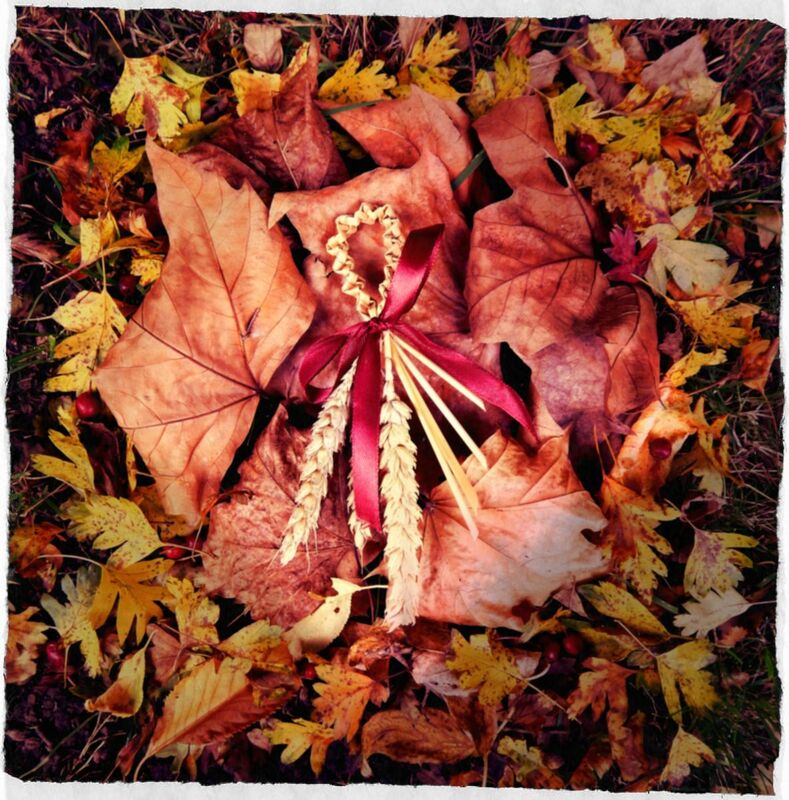 I make a set of six, tie with a pretty tartan ribbon, then tie a loop of cotton at the top of the corn dolly so that they may be hung from the tree. These make wonderful gifts that have always been received with great delight. Follow these easy steps below to make your own! 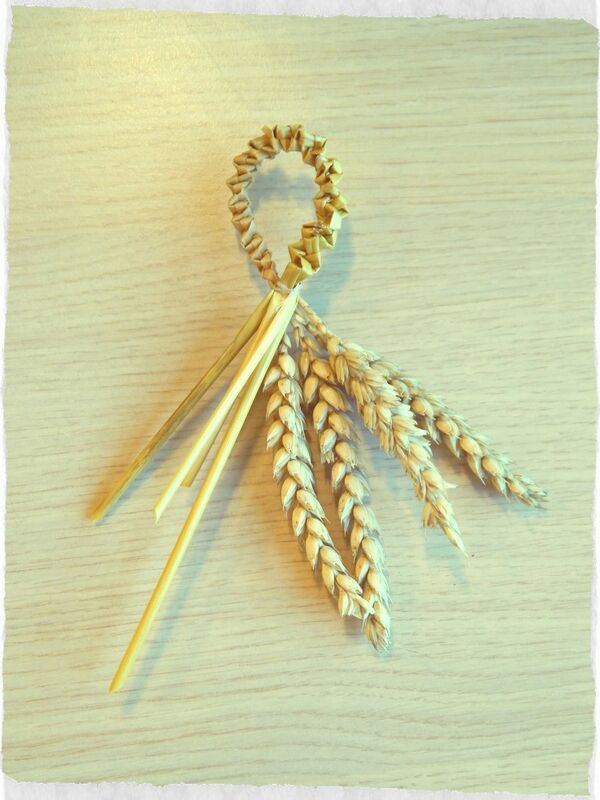 Make sure that your wheat stalks are of similar length and have no knobbles in the stalk. These would cause the stalk to snap when you are working with them. When choosing your ribbon, make sure that the pattern shows on both sides, or else it will look messy when you tie it into a bow. 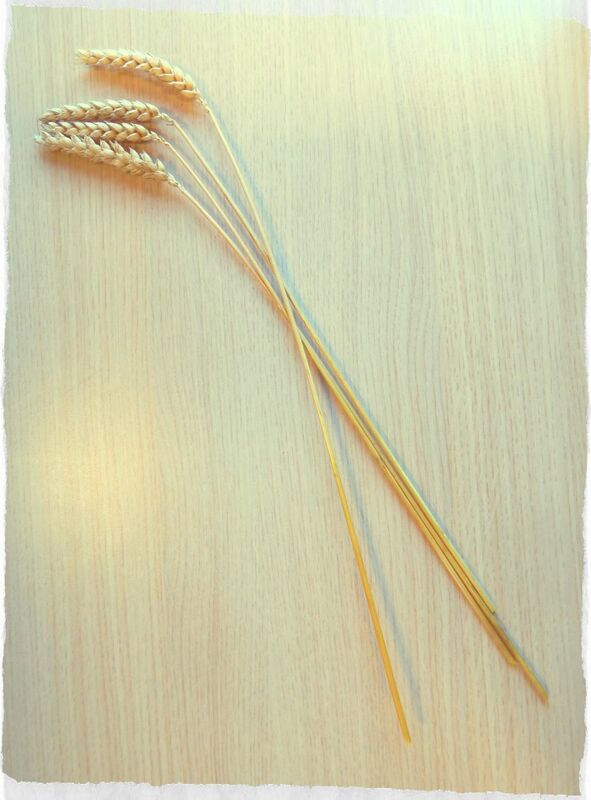 Soak your wheat for a minimum of 45 minutes before you begin. 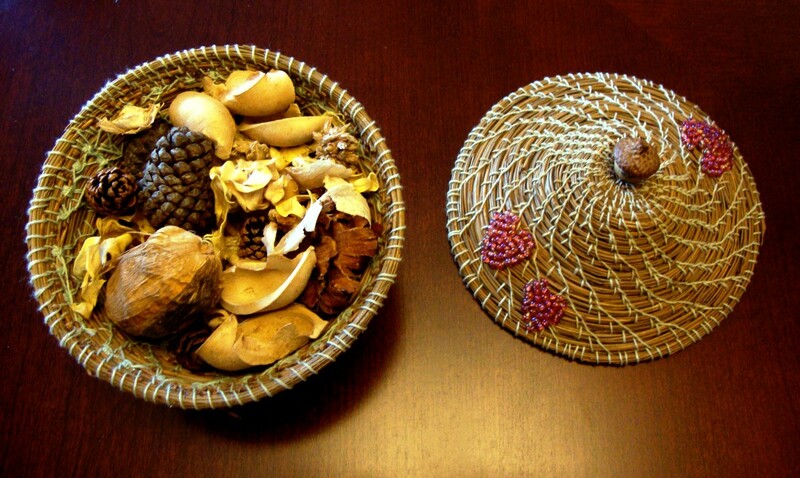 This will make it supple and will allow you to bend and twist it without it snapping. You can keep batches damp by rolling them in a wet tea-towel once they have been soaked, which prevents them from drying out as you work. 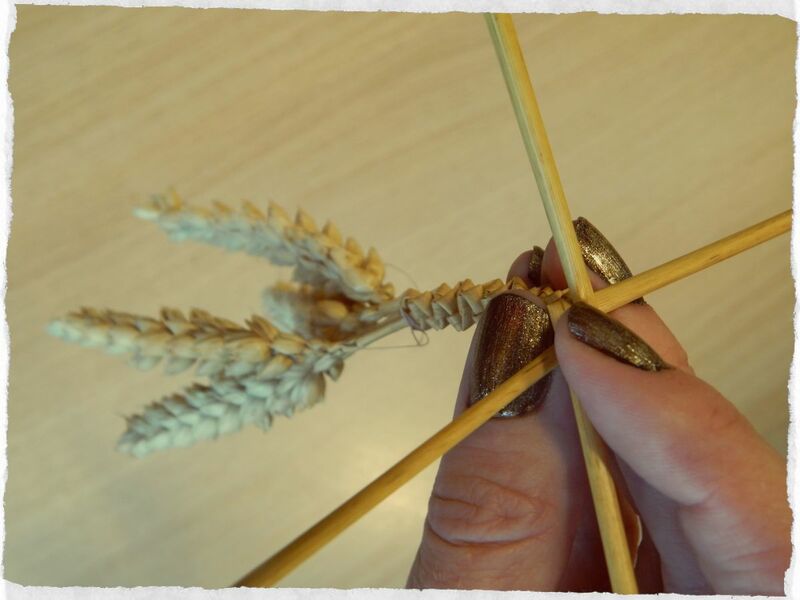 Take four stalks of wheat and bunch them together. Cut off a length of cotton, and wrap it around the stalks to hold them together, then tie them to secure them in position. You want the cotton to be just beneath the heads, a few millimeters down the stalk. You will need quite a bit of space, as you will be separating the straws for the fullness of their length. 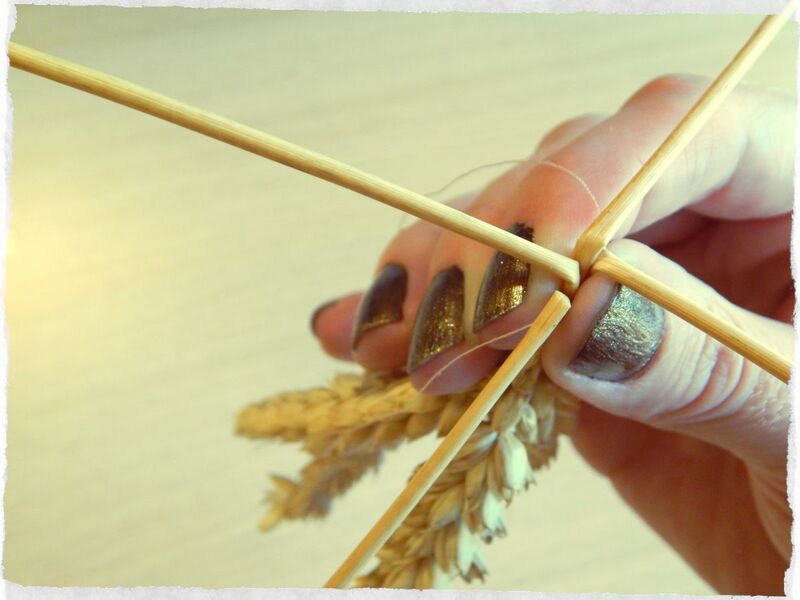 Holding the tied wheat with the heads pinched beneath your finger and thumb, bend each straw until you have them pointing to the four quarters. It is easier to think of them being as four points on the compass; north, east, south, and west. It will look a little like the rotor blades of a helicopter if you have got it right! It sounds a bit tricky, but believe me, this is very easy to do. As I mentioned before, think of the straws as being points on a compass. You will need to fold the north straw so that it points south. Then fold the south straw so that it points north. 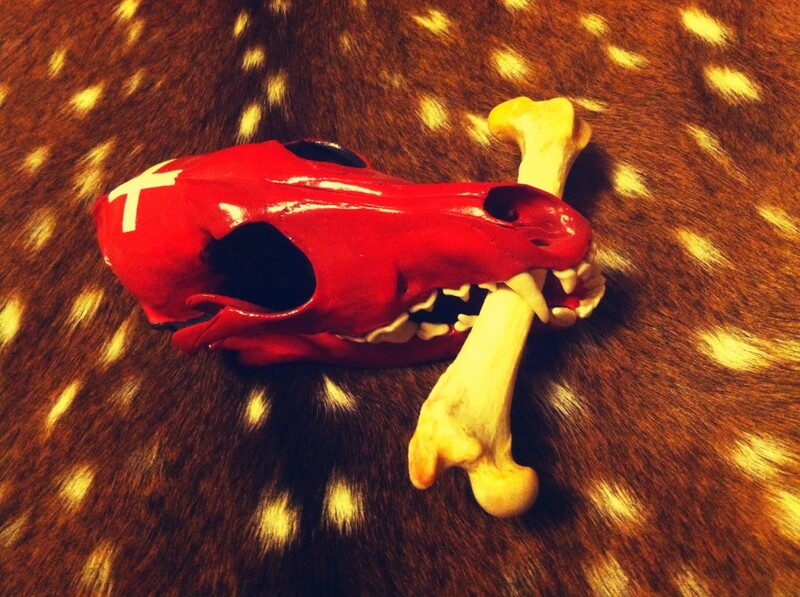 Fold the east straw to point to the west. 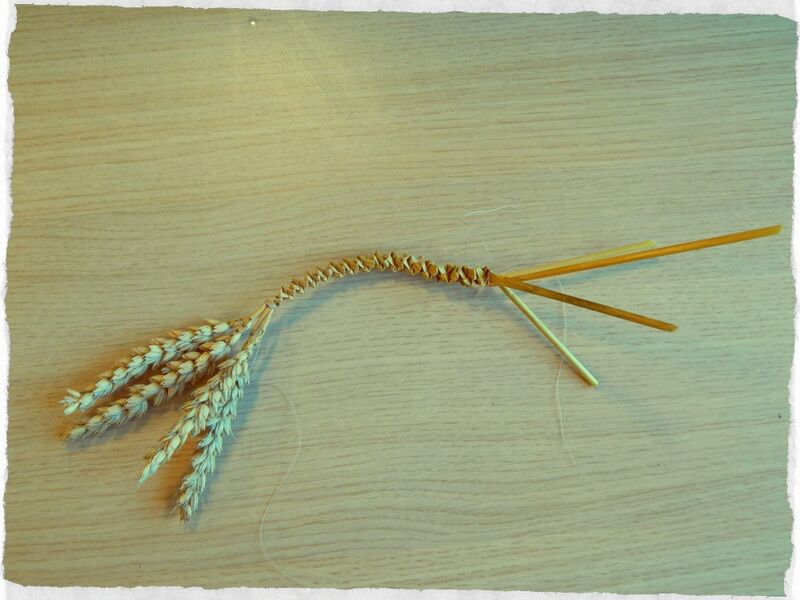 Finally, fold the west straw to point to the east. So that is north to south, south to north, east to west, then west to east! Remember this as you repeat and work down the straws. As you fold along the straws, pat them into place and secure them with your thumb to prevent it all springing apart. You will soon notice a lovely structure forming along the stalks. 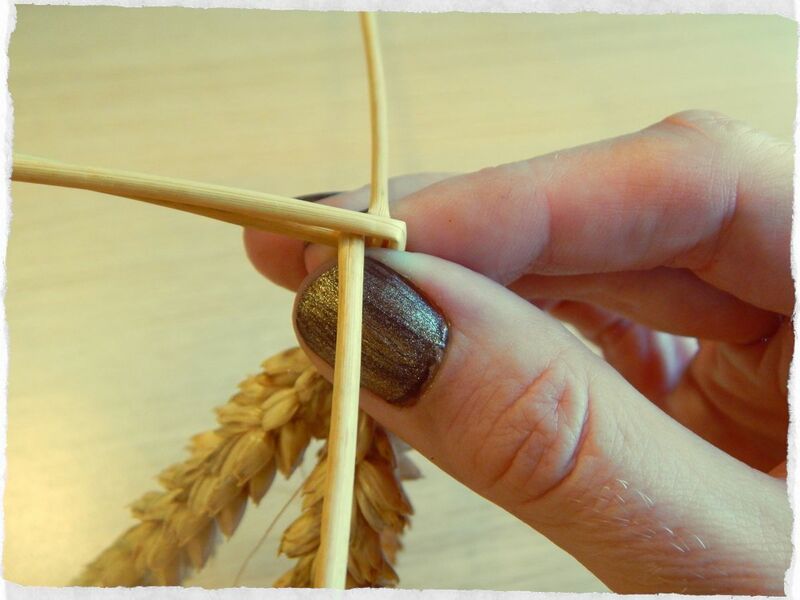 If you want to make a larger Gentleman's Favour, with maybe two loops in it instead of one, cut the head off a straw and stuff it in to the end of your first one to give more length to work with. Repeat for all four stalks. Then carry on folding. The folds will hold these new stalks securely in position. 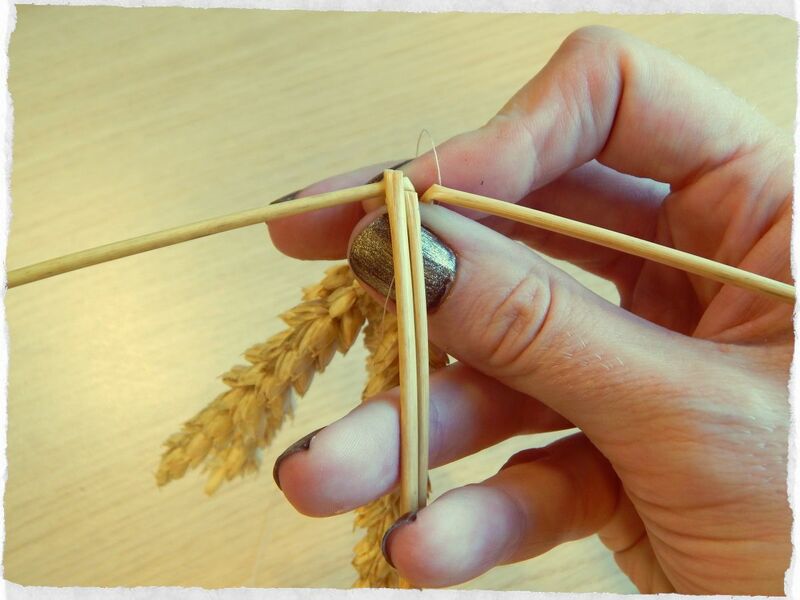 Continue with your folding until you have about 3 inches of stalk left on the shortest straw. When you are happy with the length, take some cotton and tie the straws where you have finished your folding. Be careful not to tie it too tightly, or else the cotton will snap. 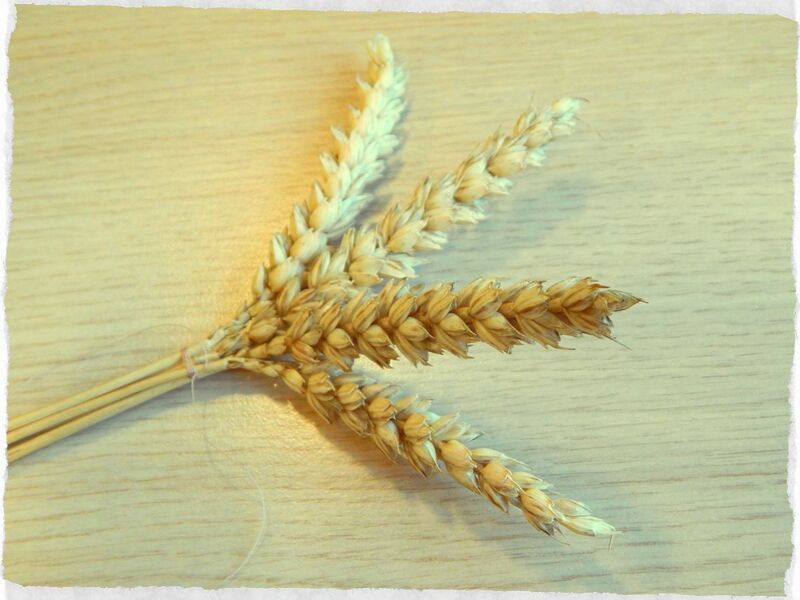 Turn the piece so that the heads of wheat are at the bottom. 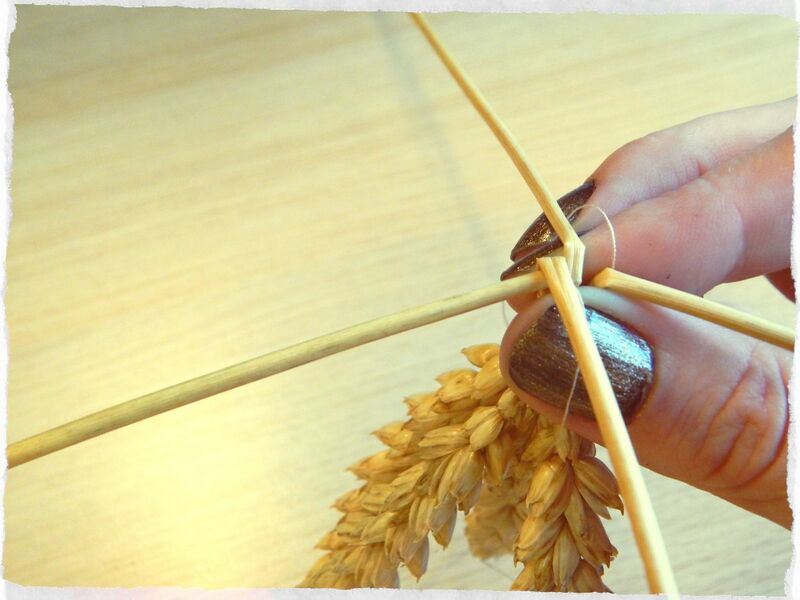 Then fold the stalks over so that the two tied ends of the folds meet. Where the straight stalks cross over will be the back of your corn dolly. 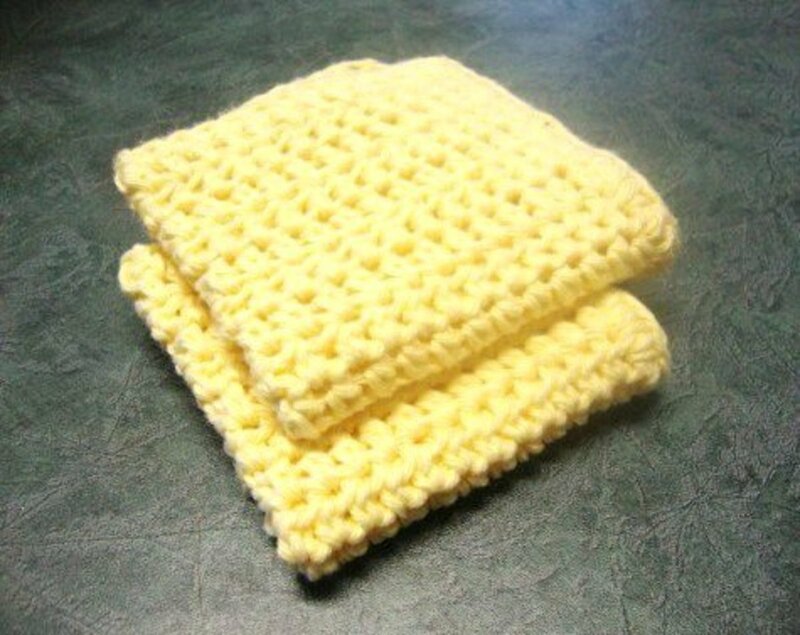 Secure them in place with cotton, and then turn your corn dolly over. 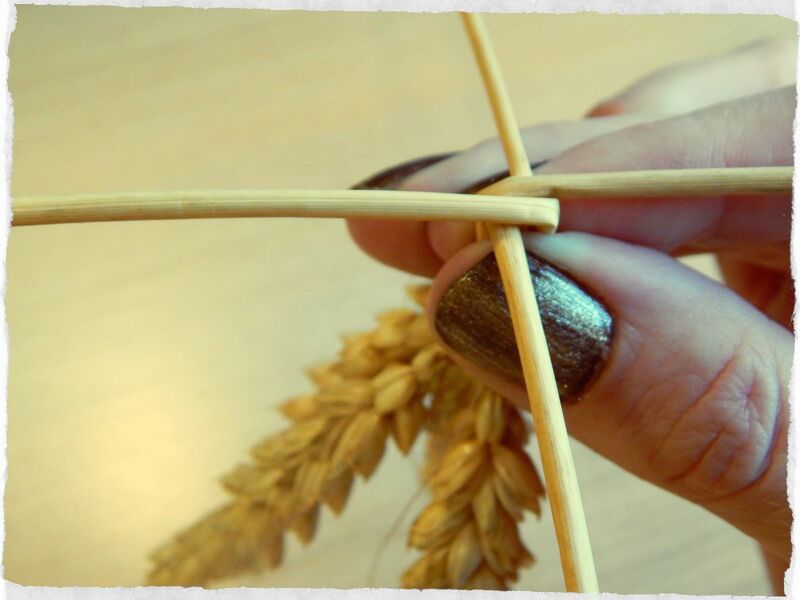 The unfolded stalks will give you a little flourish to one side. Trim these so that they are of an equal length, then trim all the loose ends of cotton. Finally, choose a ribbon, and tie a bow around where your loop folds. All done! You now have a beautiful Gentleman's Favour to keep or give as a gift. These will last for many years if kept dry. Thank you both! They are pretty simple to make, I hope you enjoy trying it out. Very pretty! Your instructions are very clear.